Electric companies continued to restore power across the Carolinas yesterday as remnants of Hurricane Florence dumped more rain in the area. Florence's diminished winds likely spared much of the power grid, but heavy rains are behind a collapse at a Duke Energy Corp. coal ash disposal site at the L.V. Sutton Power Station near Wilmington, N.C. With part of the landfill washed away, coal ash escaped into Sutton Lake along the Cape Fear River. Duke issued a statement saying it does not believe the incident poses a risk to public health or the environment. Still, nearby residents didn't like the sound of it. Water quality became one more problem on top of the massive flooding and wind damage. "I don't think I'd want to drink it," said a man who gave his name as Hank, taking a break from inspecting the damage to his trailer. Others living near the Duke plant said they weren't drinking from the taps at all. Deep water covered the northern route to the Sutton plant as sheriff's deputies evacuated nearby homes, some of which had begun to flood. Industrial sites and trailer parks dot the area, and the smell of burnt popcorn cut through the rain. State and company officials said it could take a while to determine to what extent the coal ash spill poses a danger to people in the area. Coal ash is the toxic residue left after power plants burn coal, and it's a brew of lead, mercury, arsenic, cadmium and other heavy metals. 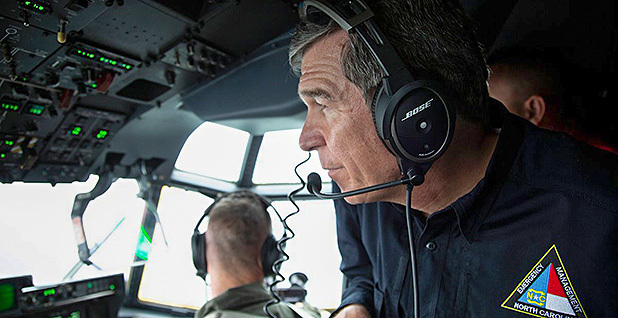 Floodwaters and other hazards are preventing North Carolina inspectors from getting to the area, North Carolina Gov. Roy Cooper (D) said at a briefing yesterday. "I think it's just flooded around, and you can't get to it," he said. Duke's inspectors found a collapsed slope and erosion at a lined landfill at the former coal-fired Sutton plant, which is now a natural gas power station. Roughly 2,000 cubic yards — enough to fill two-thirds of an Olympic-size swimming pool — were released. The utility said it's unclear how much of the stormwater may have reached Sutton Lake, which it referred to as a cooling pond built to support plant operations. The 1,100-acre lake is known to the public as a popular fishing destination. It is next to the banks of the Cape Fear River, which reached flooding stages yesterday. Duke, in its statement, sought to reassure residents. It leaned on a 2014 coal ash disposal rule from the Obama-era EPA that determined coal ash doesn't have to be treated like a hazardous waste. The rule emerged after years of utility industry lobbying for weaker regulation. Since then, the Trump administration has sought to shift more regulation of coal ash to the states. Duke's ash ponds at Sutton have had a storied history. The state fined the utility a record $25 million in 2015 for years of groundwater contamination. North Carolina Department of Environmental Quality officials say they have been monitoring coal ash impoundments across the state. "Once the damage is assessed, DEQ will determine the best path forward and hold the utility accountable for implementing the solution that ensures the protection of public health and the environment," said DEQ spokeswoman Megan Thorpe. The collapse is perfect fodder for environmental groups, who have argued for years that Duke is not safely storing ash at its coal plants. Their criticisms got louder in 2014 after a pipe burst at a plant in Eden, spilling 30,000 tons of sludge into the Dan River near the North Carolina-Virginia border. Duke agreed to pay millions of dollars in fines for the spill, which led state lawmakers to call for stricter coal ash regulations. The basins at the Sutton plant are "well on their way" to being excavated, with 4.3 million tons out of nearly 7 million already being cleared, Duke spokeswoman Paige Sheehan said in an email to E&E News. The utility is working aggressively to meet a state deadline of August 2019, she said. There are 31 coal ash basins at Duke's coal-fired plants in North Carolina. Half of its 14 coal plants are now closed. David Fountain, president of Duke Energy North Carolina, told reporters last week that the levels of water in those basins were lowered already as the utility moves through its program to close them. Duke's bigger concern is rivers and creeks that are likely to flood and flow into cooling water intake ponds at those coal plants, Fountain said. Those ponds do not have coal ash or any other toxic chemicals in them, he added. Duke shut down its Brunswick nuclear power plant Thursday because it was in Florence's path. Federal safety regulations require electric companies to temporarily close nuclear plants that may face sustained Category 1-force winds. The Union of Concerned Scientists last week issued statements of caution about flooding at the Brunswick nuclear plant and one owned by Dominion Virginia Power. Florence's fierce winds were once at Category 4 strength but weakened to the point that meteorologists downgraded it to a tropical storm by Friday. At that point the storm had grown in size and also slowed to a crawl, elevating already heightened fears about storm surge and flooding. Electric companies such as Duke said they were preparing for the worst and had 9,400 outside workers to assist their own crews. The Edison Electric Institute has a "war room" that's monitoring and helping to direct power restoration efforts. As of 4:30 p.m. yesterday, there were 613,532 outages in North Caroline and 32,471 in South Carolina, down from more than 1 million Saturday. EEI said that as weather permits, crews are building staging sites, assessing damage, and restoring power where they can and when they can, provided it is safe to do so. There are more than 40,000 workers from across the country and Canada that were mobilized and pre-positioned in advance of the storm. North and South Carolina's three main electric companies — Duke, South Carolina Electric & Gas Co. and Santee Cooper — all started reporting power outages in the thousands by Friday afternoon. Duke reported more than 1.4 million customers without power over the weekend. The utility restored electricity to more than 1 million of those customers by last night. The remaining customers are likely located in heavily flooded areas that either are too unsafe for workers to get to or have equipment that is under water. "People need to understand that some areas are likely to be without power for a while," said Cooper, the North Carolina governor. "I know [utility crews] are working as hard as they can." SCE&G reported a peak of 7,500 outages. Santee Cooper reported more than 50,000 customers without power Saturday and cut that number to less than 1,000 by yesterday. It still could take days to fully assess damage to the power grid as rains continue to fall and floodwaters rise. The conditions render it unsafe for crews to get to work. What's more, it's impossible to repair outages tied to underground power lines if the area around them is also submerged in water. Reporter Rod Kuckro contributed to this story.